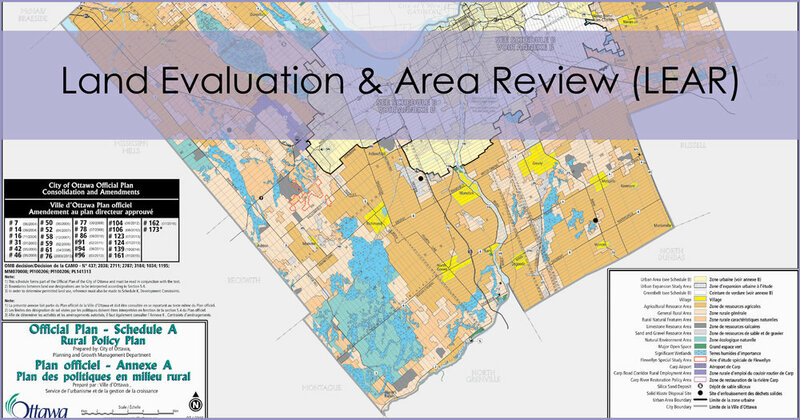 There has been much discussion in recent weeks about the City of Ottawa’s update to its Land Evaluation & Area Review (LEAR). The purpose of a LEAR is to identify prime agricultural areas using several factors in addition to soil class, in order to establish an agricultural designation in the Official Plan. The LEAR is used as a tool to then help designate Agricultural Resource Areas across the City. The Regional Municipality of Ottawa-Carleton identified the existing Agricultural Resource Area in 1997 using a LEAR system. Key components of the LEAR system are soil capability for agriculture, land use and parcel size. New soils mapping and changes in land use and the size and nature of farms in the city over the last 20 years warrant re-examining and updating the existing LEAR system. The Ontario Municipal Board has also directed the City to complete this update. The Statutory Public Meeting required by the Planning Act to consider the amendment and submissions from the public was held on the 22nd of November at Planning Committee. The report also came to the Agriculture & Rural Affairs Committee on November 24th. The report will now rise to City Council at its meeting on December 14th. If you did not submit comments to either Committee, you can still do so up until the Council meeting. Council will be considering objections submitted in writing up until it makes a decision on December 14th. Written submissions received before December 9th will be reviewed by staff and if agreed to motions for change will be presented to Council. All submissions must include the reasons why the existing or proposed designation should be changed - this should include soil sampling and independent assessment in accordance with the LEAR model. There have been some changes in the LEAR system that the City is using now versus what was used in 1997. Some of the weighting has changed and the threshold for lands to be considered agriculture was lowered from 130 to 125. This was the recommendation from City staff. In their involvement through the LEAR update, they discovered that some lands were scored artificially higher in 1997. The idea was that, since the City lacks substantial Class 1 lands that the scores would reflect that and Class 2 and 3 lands were given higher scores and that trickled down somewhat. For this review, a more scientific approach was taken and it was determined that 125 was a more appropriate threshold. Ultimately, the difference in the LEAR mapping is negligible and much of the land proposed to be designated as Agricultural Resource Area actually ranks higher than 130 regardless. Having said that, lands that score below 125 can sometimes get bundled with lands that score much higher and the City evaluates the lands based on 250 hectare parcels, not individual properties. Following the December 14th Council decision on LEAR, there are still opportunities to have appeals addressed. Request for changes to Agriculture designations can be submitted to staff with supporting material (soil sampling and independent assessment in accordance with the LEAR model). Staff would review and where they agree, these could be provided to Council for Council to make submissions to the Ministry before the Minister’s decision is given on OPA 2016. Any modifications to the Official Plan Amendment would have to be agreed to by the Minister. Once the Minister makes his/her decision, those wanting to appeal then have 20 days from the date the Minister issues the decision to register their appeal with the Minister and stating the reasons for the appeal. To retain a right to appeal, written submissions must be provided to the City prior to Council making a decision on OPA 2016 on December 14, 2016. After an appeal is lodged there is a period where mediation is encouraged. This provides an opportunity for Council to consider additional information provided as part of the appeal and which may not have been available earlier. Submissions can be made to planning@ottawa.ca and addressed to Bruce Finlay. Please contact me should you have any questions regarding the LEAR update and the recommended Agricultural Resource Area designations. On December 3rd and 4th, between 10:00am and 4:00pm, come and celebrate the Season by making a Victorian styled Christmas ornament at Dickinson House. Ideas and craft supplies are provided, and the young and young at heart can bring home a lovely memento. Admission to the House and the crafts are free of charge. Donations toward the upkeep of the House are always welcome. Continuing to celebrate an old time Christmas at the House, there will be a reading of A Christmas Carol at 2:00pm on December 11th and 18th; hot chocolate, shortbread and fruitcake will be served at intermission. Tickets are $5.00, and children under 12 are free. To reserve a seat, please call 613-692-6455, or purchase your ticket at Manotick Office Pro. The House will open at 1:30pm on the days of the reading.